For all the folks with as strong sweet tooth as us, especially my better half, this flagship Indian rice pudding belongs to you whose decadence you won’t be able to resist! This recipe is really special! The Indian rice pudding a.k.a. Payesh in Bengali is not an everyday recipe; in Bengali custom, it always marks a special occasion like birthdays or anniversaries or some other milestones we achieve and this time also it was no exception. Although the date on which I am actually sharing the recipe may not be the special one, but it was indeed made for a special date! My mother-in-law made this delicious Indian rice pudding for our wedding anniversary and we couldn’t be delighted more! Thanks to my hub’s idea, we decided to shoot this video while my MIL makes this Indian delicacy as she is a pro in this and have been making it since last four decades if not more! 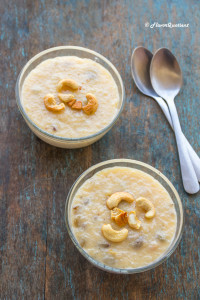 I had already shared my vanilla rice pudding recipe long time back which matches with this authentic Indian rice pudding somewhat in the techniques but is completely different in flavors. 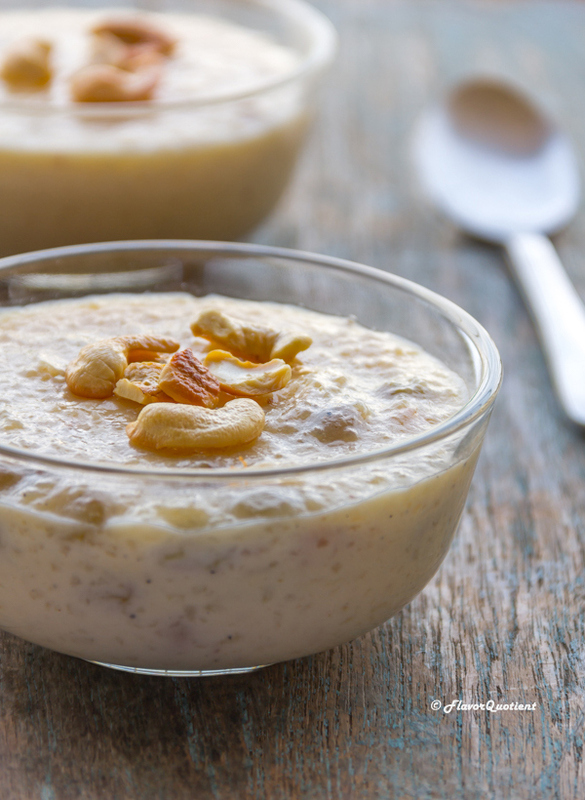 This Indian rice pudding is flavored with classic Indian aromatics and not vanilla. The primary flavor in this dish is derived from ghee or clarified butter which is a must in this recipe and must not be replaced with oil. Additionally, the green cardamom powder adds the final fineness of flavor and makes it entirely irresistible! 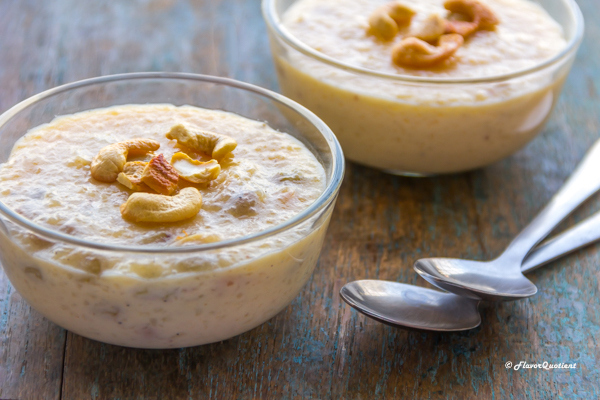 If you are not Indian or not familiar with Indian desserts, this Indian rice pudding may seem a little too sweet to you. Well, I agree! We like our desserts to be too sweet. The sweetness in our desserts signifies the degree of happiness which we celebrate with these chilled bowls of Indian rice pudding. Once the pudding is chilled overnight, the sweetness settles down and tastes incredibly delish. This is a perfect finisher to a happy celebratory Indian meal where the spicy Indian curries are complemented with the chilling sweetness of rice pudding. Making the Indian rice pudding is not as intimidating as some other Indian delicacies. If you see, there is only one spice as a matter of fact and that is green cardamom powder which is added at the very end to infuse the pudding with beautiful aroma. 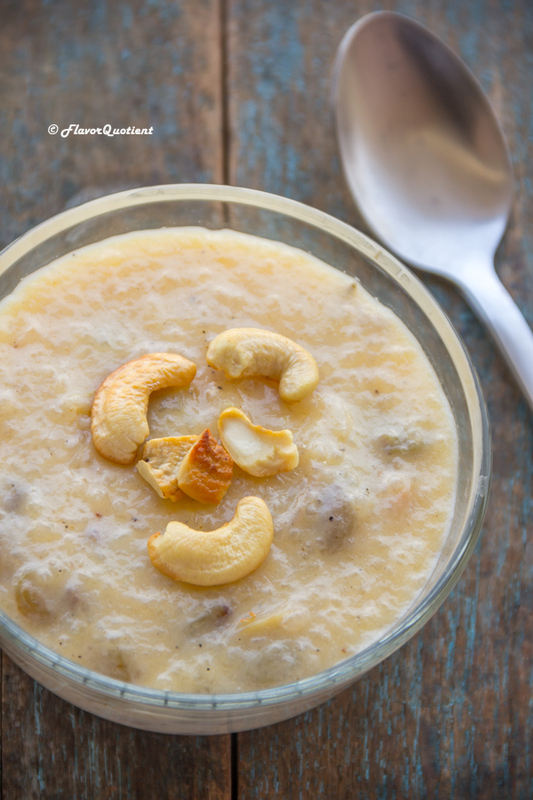 The primary flavor of the Indian rice pudding comes for ghee i.e. clarified butter which is an extremely flavorful traditional cooking fat in Indian cuisine and I am somewhat sure you are aware of what ghee is even if you are not an Indian! My MIL used only a tablespoon of ghee as she was being a little too conscious, but you must not shy away to add a little more ghee to it to make this already incredible Indian rice pudding a tad bit more sinful and extra-delicious! Heat the clarified butter or ghee in a deep heavy-bottomed skillet. Add the cashews and sauté until the cashews are golden brown. Take them out and set aside. Add the soaked and drained rice to the same skillet (add little more ghee if your skillet seems to be dry). Saute the rice until translucent for about 5 to 6 minutes on medium heat. Take them out and set aside. Now add the whole milk to the skillet and let it come to a rolling boil. Add the sautéed rice to the boiling milk and let the rice cook on lowest heat until completely done. This would take about 20 minutes. Keep stirring in between to avoid the rice sticking to the pan. Next add the sugar and mix well. Simmer the rice pudding uncovered until the sugar completely dissolves and the milk thickens. Keep stirring it occasionally. Next add the salt and give a good mix. Check for the sweetness and adjust if necessary. Sprinkle the cardamom powder and give a final mix. Add the golden raisins and fried cashew. Remove from heat and let it cool down completely. Then chill it overnight and serve chilled. Enjoy!